GE will help Chevron Corp. tap a large subsea oil and gas field located some 65 miles off the coast of Africa near the Congo River estuary. 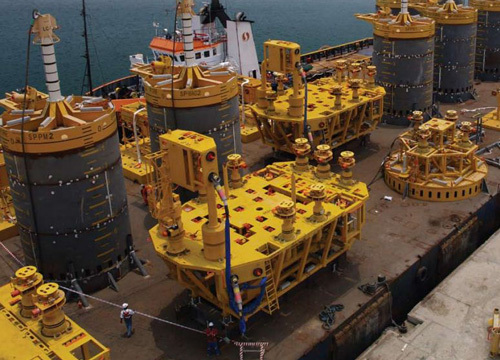 GE will build nine subsea control modules, seven subsea “trees”, and other technology valued at $165 million for the $2 billion project called Lianzi Field. The control modules are the nerve centers for subsea pumps, wellheads and other machinery. The multi-ton “trees” are an assembly of underwater valves and other equipment that control oil and gas flow. They machines work on the seabed and must withstand crushing deep sea pressures. GE machines like these subsea trees and manifolds will help Chevron pump oil from wells located 65 miles off the coast of Africa and 3,000 feet under the sea surface.